ESCANABA — A popular Bay College program introduced last summer is being held once again this year. 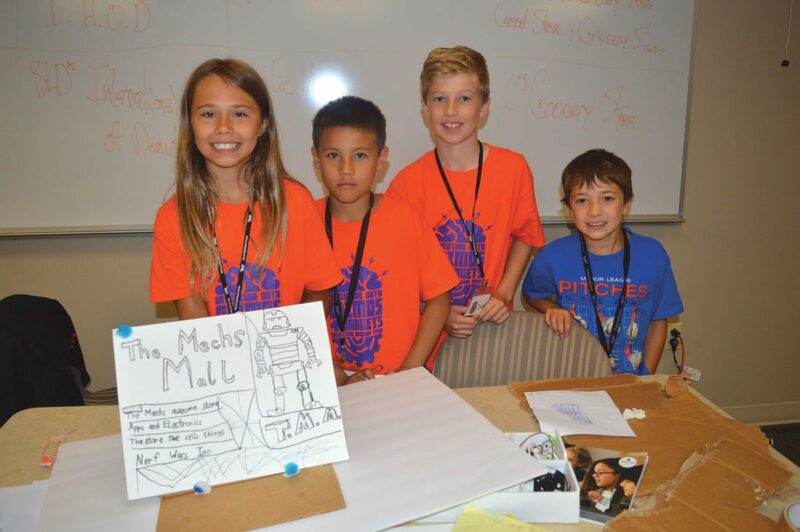 Modular electronics day camp “Inventing With Gizmos and Gadgets” returned to Bay’s Escanaba campus this summer. Bay College Grant Project Manager Beth Ann Belcher said the primary goal of “Inventing With Gizmos and Gadgets” is to give students between the ages of 8 and 12 an opportunity to have fun while learning about technology by using “littleBits.” These are magnetic, electronic building blocks which can be used to create inventions. The program also helps students develop their critical thinking and problem-solving skills. “There are some guided projects and some open projects,” Haylee Gatien said. A participant in “Inventing With Gizmos and Gadgets,” Gatien will be going into fifth grade at North Central Elementary School this fall. “It’s two wheels and two motors, and … you stick a marker in it. Then, you press the button to make it go, (and) it scribbles all over the paper,” North Central student Landen Hansen said of the latter project. Hansen will be entering sixth grade this fall. According to Belcher, the scope of “Inventing With Gizmos and Gadgets” has grown in 2017. “This year was the first year we’ve been able to expand the camp to our West Campus in Iron Mountain,” she said. Sessions at this campus were held during the weeks of June 12 and 19. This year’s program has been highly successful, Belcher said. “Every single spot in this camp (is) filled,” she said of Escanaba’s program. Belcher credited this success to the fact that the program fills a niche in the area. “I just think there’s such a strong need for learning programs like this that are fun for kids,” she said. Leading both the Iron Mountain and Escanaba camps are instructors Michael Malone and Maddie Laviolette of Hermansville-based company Stewart Manufacturing, which is a sponsor and partner for the program. “Instead of a monetary donation, we help teach,” Laviolette said. “It’s all about creativity,” Laviolette said. Belcher said the “remix” stage, in which students look at their initial designs and improve them, is one of the most important elements of the program. “To me, that’s what inventing is all about,” she said. As it incorporates both technical knowledge and creative self-expression, Laviolette said “Inventing With Gizmos and Gadgets” is considered a STEAM (science, technology, engineering, arts, and mathematics) program. “We definitely tie the arts into it,” Laviolette said. By working on projects in small groups, “Inventing With Gizmos and Gadgets” participants have also been able to develop their teamwork skills. “They’ve been working well together in groups and bouncing ideas off each other to accomplish the projects that we assign,” Laviolette said. Gatien said this was one of her favorite elements of the program. “The more you work as a team, the more you get better at it,” she said. “It’s really fun, and it makes you think a lot,” he said. Laviolette said that she is glad to be involved with this program, and that she hopes it will continue into the future. “We’re really happy to partner again with Bay on this, as well as (in) years to come,” she said.